Hello, I've been struggling with this for a while now. If say I plug a network printer onto my network and then search the network for IP address and host names I can see for example HP-Laser-Printer.home This works whether directly connected to my PC or via a router with DHCP. I would like my Arduino to act in the same way, but for the life of me I am unable to do this. All it does is report the host name as WIZnet and then the last 3 bytes of the mac address. Using EthernetBonjour3, and settings such as: #define HOST_NAME "xxxxx"; or EthernetBonjour.begin("xxxxx"); do not work, I still see WIZnet + mac. Hardware is STM32F103 blue pill and Wiznet w5500 SPI board. I've try'd adjusting settings in the Dhcp.h and Dhcp.cpp files, all to no success. This along with re-setting the router and even deleting the data it has for the mac address. Is there an mDNS / Bonjour setting or service I'm missing, or more to the point does someone have a code example that actually works? The default of EthernetBonjour is the string provided by the begin() method and ".local" added. Where do you see that WizNet-MAC-combo? In the DHCP server logs? Yes, I see WIZNet-EFFEED in my router DHCP log and if I run a network device search. This does not change regardless of what code I call or example I use. There is no code leading to the effect, it's more that every code example I've tried does not change the default hostname. it all has no effect. I can see in the Dhcp.h file the cause, but am unable to create a fix. No amount of fafing around with this achieves anything other than the device either not appearing on the DHCP list, or defaulting to WIZnet + MAC. If I plug in another network enabled device (Printer, NAS drive, Scanner, LXI test equipment) I see its name displayed, and this is regardless of wether it's Static or DHCP. Why can the W5500 not do this? Perhpas the hardware is not capable, and if so what should I be using. If I could just find a working example (code and hardware) then that would be a start. That's completely unrelated to mDNS/Bonjour. 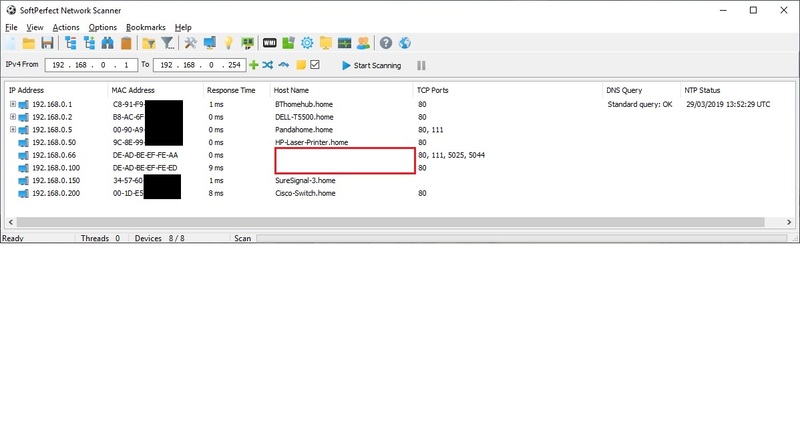 The DHCP code is in the Ethernet library and the host identification used there is not available as a parameter. If you think you must change it you have to modify the Ethernet library. The WizNet part is defined in Dhcp.h, the rest is a part of the MAC address. Usually nobody cares about the DHCP identifier as it's not used for anything else than logging. So why do you care about it? As I've said before, when you plug in a network device such as printer, regardless of static or DHCP IP it still shows on the network with a name thats relevant to the make and model. How do I get my project to do this? Define "shows on the network"! Is the meaning still "shows with that name in the DHCP log"? By default it shows up on the network only with it's MAC address. Everything else needs some kind of protocol action. But as you've already seen there are many ways to show up on a network with a name and depending on the protocol used the way to get there is different (DHCP-ID, Bonjour/mDNS name, (reverse) DNS name, WINS name, etc.). Hi Pylon, and thank you so much for taking the time to answer. You are correct, and I need to revise what I'm saying. I need mDNS/Bonjour to report a .local network name. I need the device regardless of DHCP or Static to still display this name. I want all trace of WIZNet-mac to be removed from all naming protocols (DHCP-ID, Bonjour/mDNS name, (reverse) DNS name, WINS name, etc). STM32F103C8T6 and W5500 connected via SCP. Bellow is what I currently see, or the red box is filled with WIZnet-mac. I want it to report the name of my choice. I want all trace of WIZNet-mac to be removed from all naming protocols (DHCP-ID, Bonjour/mDNS name, (reverse) DNS name, WINS name, etc). Why? Why is this so important to you? I need mDNS/Bonjour to report a .local network name. I need the device regardless of DHCP or Static to still display this name. The EthernetBonjour.begin() call is supposed to do exactly that. What do you get with a Bonjour/mDNS scanner if you run that sketch on your board? Do you need it exactly for that scanner? As far as I found information on the Net about this scanner it uses a proprietary algorithm to get these "Hostname"s, so it might do several things and display any name. Ask the vendor about what exactly the scanner does in what order to be able to provide the correct name for that scanner. Thank you for getting back to me again Pylon. Renaming is important as I have many projects all on the one network, I do not want to see a list of WIZnet-mac host names then have to decipher which was which, I want to see my project name in what ever way I choose to search. If it were a commercial product it most defiantly would have the manufactures name for every type of search and not display the Ethernet interface manufacturer. EthernetBonjour.begin("My-Project"); // Initialize the Bonjour/MDNS library, always call this before any other method! In my tries with an adapted version of your code (I used EthernetBonjour instead of EthernetBonjour3 because the latter uses the Ethernet3 library which doesn't work on my system) I had no problems, setting a correct mDNS name (I used "arduino" and the Arduino was accessible by the name "arduino.local") as well as changing the DHCP-ID in the Dhcp.h file. Keep in mind that you have to reboot your PC/router after every change you made to the values as the mDNS stuff is kept for a longer time period, otherwise you might be presented older values. I don't know what you have to change to make this work on the STM platform as this platform seems not to use the standard Ethernet library but it's own variant Ethernet_STM. #define HOST_NAME "My-Required-Name"	//ORIGINALLY #define HOST_NAME "WIZnet"
EthernetBonjour.begin("My-Required-Name"); // Initialize the Bonjour/MDNS library, always call this before any other method! All is working perfectly, and with every search app the correct data is displayed.